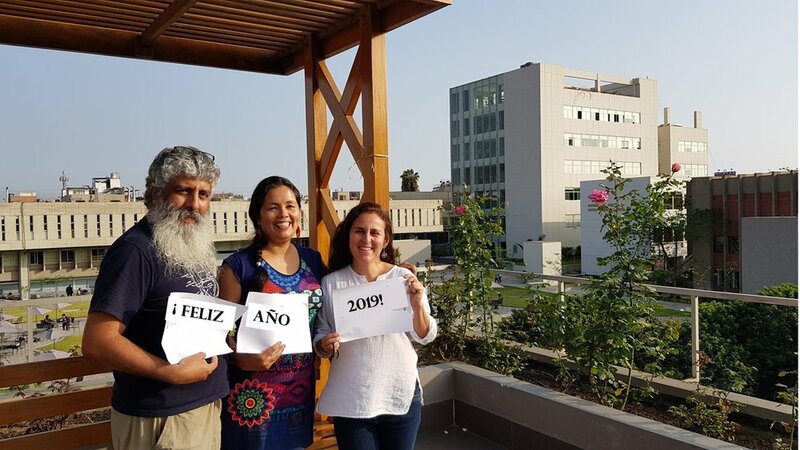 As we look forward to the new year that lies ahead, we reflect back on some of the exciting work and events that took place in 2018. One such event included a series of results sharing events with collaborators and community members in Buhoma, Uganda, facilitated by IHACC team members Didas Namanya (IHACC Principal Investigator, Uganda Ministry of Health), Kate Bishop-Williams (PhD Student, University of Guelph), Bianca van Bavel (PhD Student, Leeds University), and Grace Asaasira (Research Assistant, Makerere University) in July 2018. 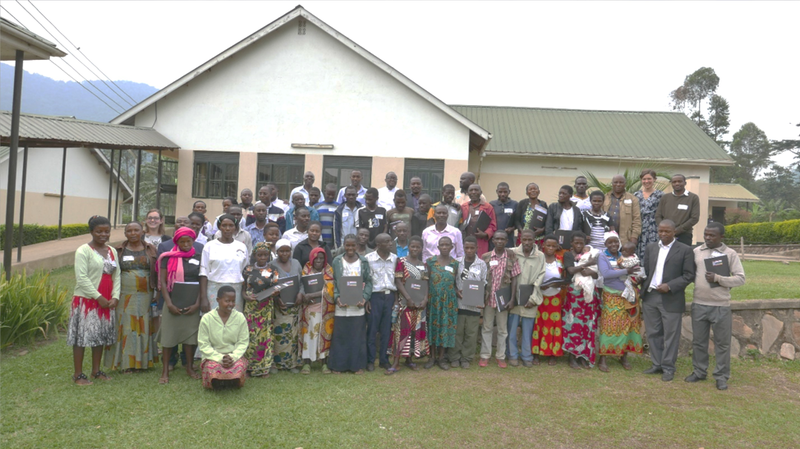 Group photo of workshop participants and facilitators, Uganda Nursing School Bwindi, Buhoma. The first research meeting occurred at the Bwindi Community Hospital to discuss, interpret, and contextualize the results of PhD student Kate Bishop William’s research about the impacts of weather patterns on hospital admissions and acute respiratory infections. In total, 68 staff members ranging from administration to nurses and doctors attended the meeting. Discussions primarily focused on the interpretation of key findings. Student translators from the Uganda Nursing School Bwindi managing the workshop registration table. A results dissemination workshop also took place at the Uganda Nursing School Bwindi, in Buhoma, Uganda. In total, 68 participants attended the workshop, with representatives from local Indigenous settlements, local authorities, district and sub-county officials, hospital and nursing school staff, as well as NGOs and village health teams. This was a unique opportunity for a diverse group of people with expertise in different fields to interact and engage directly with the research results and with each other. Workshop presentations covered preliminary results and key findings from 12 different IHACC-related projects. Topics ranged from Indigenous and non-Indigenous areas of maternal health; impacts of weather and seasonal variability on health and hospital admissions, nutrition, food security, and crops; prevention of vector, water, and food borne diseases; as well as community-based surveillance systems. Three participatory sessions enabled participants to break into smaller groups to discuss specific questions related to the interpretation of results and more. Ideas and perspectives were recorded via different participatory strategies and shared with the larger group afterwards. Groups discuss and share during participatory breakout sessions. In addition to the workshop being a great opportunity to discuss research results, it also presented opportunities for capacity building in Buhoma. For instance, Didas Namanya and Grace Asaasira conducted a training session in public speaking and translation with four students from the Uganda Nursing School Bwindi who later practiced these skills during the workshop. The full day event provided a space to share preliminary results, discuss findings, listen to feedback, and consult about the future of climate-health monitoring and research activities in Kanungu District. Some participants voiced the desire to have additional targeted meetings to develop these ideas and discussions in greater depth, and the IHACC Research Team looks forward to continuing this dialogue and refining the ways in which we share results, integrate feedback, and inform future research. A participant asks a question during one of the workshop presentations. IHACC is in the process of recruiting a PhD student through the Panorama NERC Doctoral Training Partnership competition, to work under supervision of Dr. Lea Berrang Ford at University of Leeds in the UK. The project is titled "Integrating local and Indigenous knowledge with climate modelling in Uganda: an 'ethno-climatology' approach". The deadline for applications is January 7, 2019. For more details about the posting and to apply, click here! The first IHACC Newsletter has been published! Newsletters will be archived on the IHACC website, and can be accessed under the "Newsletter Archive” tab on the News page. You are able to subscribe to future issues through the subscribe link in the footer of this site, or through the newsletter itself. Newsletters will be distributed on a quarterly basis - stay tuned for the second issue in early 2019!